We Want To Represent You! 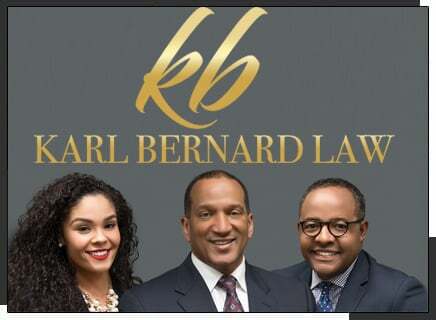 Karl Bernard Law engages in a broad civil practice and is active in the areas of labor and employment law, general business litigation, civil rights, contractual rights, sports and entertainment law, oil and gas law, small successions and personal injury law. Whether in state or federal courts, or before local, state, or federal administrative bodies, the firm provides its clients with the knowledge and the know how necessary to win. Whether you are an employee or a business owner, our team of attorneys and staff will provide you with responsive and effective legal representation. We have successfully litigated matters involving labor law, employment law, contractual rights, civil rights, defamation, probate issues, personal injury law and other civil and even criminal matters. Additionally, the firm has successfully negotiated the following contractual matters valued at nearly 100 million dollars: pay-per-view telecast and other broadcast rights agreements (both domestic and international); professional player and head coaching agreements; endorsement and licensing agreements; life story rights agreements; production and producer agreements; NCAA compliance issues; recording and managerial contracts; event promotional agreements (venue, artist, production, theatrical, etc. ); and non-profit and for-profit business incorporation and business operational matters.